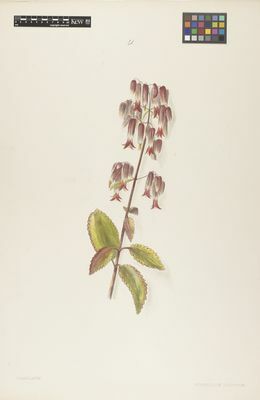 This species is accepted, and its native range is Madagascar. It is used to treat unspecified medicinal disorders. Naturalizada y adventicia en Colombia; Alt. 150 - 2700 m.; Amazonia. Alt. 150 - 2700 m.
Lou gawou, fey choche, zeb maltet. A completely glabrous perennial, succulent plant. Stem up to 2 m. long, erect or ascending, stout, terete, simple, spotted or striped with red, sometimes with sterile shoots at the base. 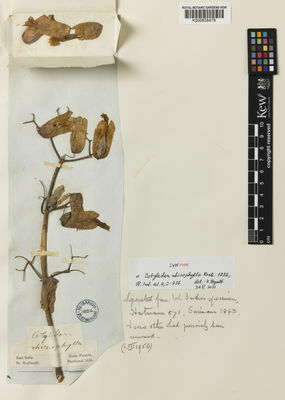 Leaves decussate, imparipinnate, sometimes some or all of them reduced to the terminal leaflet; lamina 6–20 x 4–12 cm. ; leaflets 3–5, circular, ovate or ovate–oblong to oblong–spathulate, the terminal one the largest, obtuse, broadly crenate, doubly crenate or crenate–dentate at the margin, usually contracted at the base or sometimes attenuate into a petiolule, flat, green with violet lines on the upper side; petiole 2–10 cm. long, semi–amplexicaul. 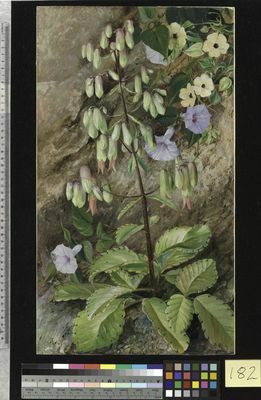 Flowers pendulous, in cymes grouped in terminal, ample loose panicles; pedicels 10–25 mm. long, slender, divaricate, reflexed at the extremity. Calyx broadly cylindric–tubular, sunk at the base, green, sometimes striped with red or red–violet; calyx–tube 21–31 mm. long; lobes 7–10·5 x 7–11·25 mm., deltate to subsemiorbicular, acute. Corolla longer than the calyx; tube 25–40 mm. 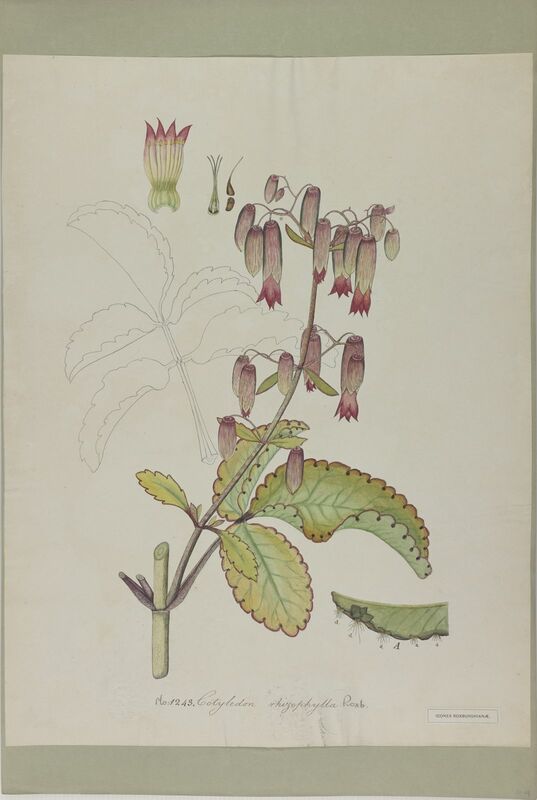 long, suburceolate–8–angled at the base, constricted above the carpels and then elongate–tubular–4–angled, green below, bright red or purple upwards; corolla–lobes 9–14 x 4·3–6·5 mm., deltate, abruptly acuminate, very acute, spreading. Stamens slightly exserted; filaments inserted below the middle of the corolla–tube; anthers 2·6–3 x 1·6–2·2 mm., ovate. Follicles 12–14 mm. long, ovoid, connate at the base for 2·2–3·5 mm., attenuate into the styles; styles 22·5–30 mm. long. Seeds c. 0·8 x 0·35 mm., obovoid, obtuse. Scales 1·8–2·6 x 1·4–1·8, subquad–rate, obtuse or emarginate at the apex. Succulent perennial herb, probably rhizomatous up to 2 m. high; stems branched from the base, somewhat woody at the base, glabrous. Leaves opposite and decussate, in adult plants only present in the upper parts, ± leafless at anthesis; lower leaves simple, upper often 3- or 5-foliate; leaf-blade oblong-oval up to 9 cm. long and 5 cm. broad, possibly larger, apex obtuse, base cuneate to truncate, margin crenate, sometimes obscurely so, glabrous; leaflets of compound leaves similar to simple leaf; petiole ± 3 cm. long for simple leaves, up to 6 cm. and more for compound leaves, semi-amplexicaul. Inflorescence a lax terminal cyme; leaves of inflorescence similar to the foliage leaves but smaller, lower 3–5-foliate, simple above and on the ultimate branches; pedicels slender. Calyx cylindrical; tube up to 25 mm. long, 8 mm. diameter, slightly indented at the base, green with longitudinal reddish mottlings near the base, green above; lobes ovate-triangular, 7–10 mm. long, abruptly acuminate, persistent in fruit. Corolla cylindrical, green below, red above; tube 30 mm. long, strongly constricted ± 8 mm. from the base, markedly 8-fluted and gibbous below the constriction, sparsely glandular-pubescent, especially near the base; lobes oblong-ovate, ± 10 mm. long and 6 mm. broad, abruptly long-acuminate, recurved. Stamen-filaments adnate to the corolla-tube below the constriction, free for 25–27 mm. ; anthers oblong, 3 mm. long. Nectary scales subrectangular, ± 2 mm. long, 1.7 mm. broad, adhering to the base of the carpels, yellow. Carpels oblong-ovoid, up to 10 mm. long, free or slightly connate at the base; style slender, 27–30 mm. long. Seeds ellipsoid-oblong, ± 0.5 mm. long, obscurely longitudinally striate. Riverine, among rocks, also in shade of trees; ± 10–1600 m.
Crassuvia floripendia Comm. ex Lam. Colombiana, patriota, hoja del soldado, bruja, hoja santa, espíritu santo, hoja del aire, planta de la vida, air plant, centaura. Wiriadinata, H., Girmansyah, D., Hunter, J.M., Hoover, W.S. & Kartawinata, K. (2013). 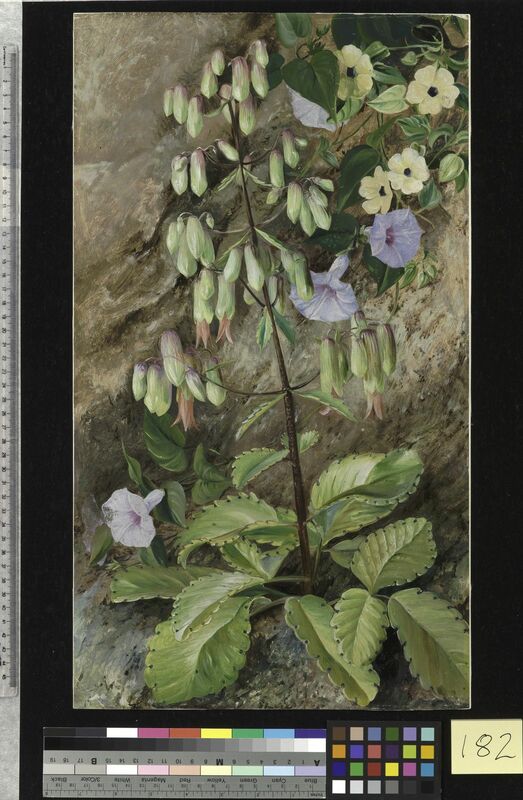 Floristic study of West Sumbawa, Indonesia Reinwardtia 13: 391-404. Hurrell, J.A. & al. (2012). 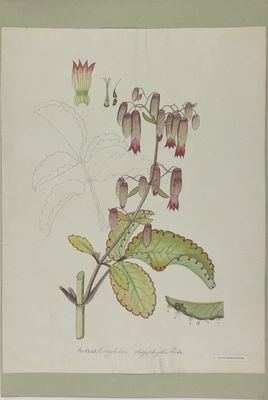 Bryophyllum (Crassulaceae): especies ornamentales naturalizadas en la Argentina Bonplandia. Corrientes 21: 169-181. Sosef, M.S.M. & al. (eds.) (2010). Flore du Gabon 41: 1-75. Muséum National d'Histoire Naturelle, Paris. Wickens, G.E. (1987). Flora of Tropical East Africa, Crassulaceae: 1-66.